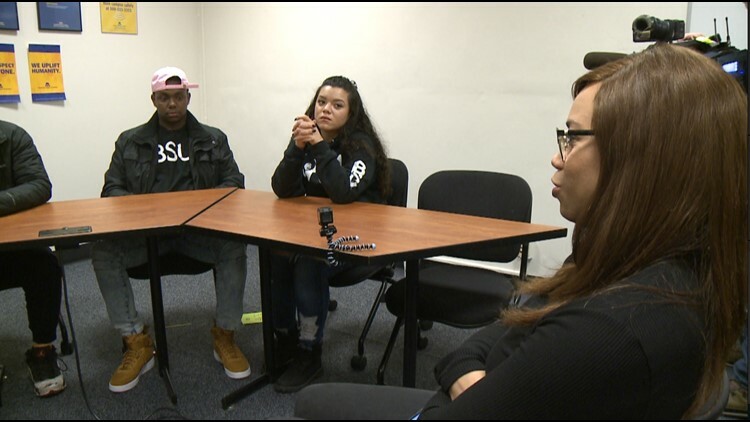 SPOKANE, Wash. — As KREM 2’s Black History Month series concludes I sat down with Spokane Community College's Black Student Union to talk about some of the issues the African American community still faces. And we got their perspective on how we can create understanding and acceptance among all of us. We interrupted their regularly scheduled BSU meeting to have an important conversation. These conversations of race, identity and equality are happening all around us, but even more so this time of year when people are faced with their past while trying to navigate their present and looking to their future. The group of six was made up of three women and three men. As we went around the table each person brought with them their experiences, thoughts and feelings. “You usually hear Martin Luther King, Rosa Parks, Malcom X, but you don't hear the others ones, the ones that are not being spoken for and learning where you come from,” Shaya Holland said. "It's extremely important to preserve our history and recognizing what black people and people of color have gone through,” Myia Crawford said. What does it mean for you to be a person of color? "I feel like we are imitated and we like have a role to play,” Reneece Bailey said. "So as people color we are always watched. We are always judged. We're basically an example for a lot of people of what not to be. A lot of people look at black people in a negative light,” Tylek Waite said. “Eyes are always on you. You have to watch what you do. You have to watch what you say. You have to fight the constant battle of being a stereotype,” Holland. “I honestly don't care what people may think about me, because they don't know me personally,” Amari Willis said. "It's hard sometimes to feel comfortable in your own skin when you're just like kind of existing and people seem to have a problem with it,” Crawford said. “I don't feel like I am being watched or judged. I feel like I am being admired,” Bailey said. How do we solve of the problems and resolve some of the feelings people have when it comes to race, specifically, in Spokane and in the Inland Northwest? "I guess it just communications barriers. We don't both feel comfortable talking, which is sad. Spread awareness of groups like these and let them know that we are open to all and we are understanding,” Bailey said. “Start going to BSU events. Start going to the NAACP events. And just having the courage to come up and say ‘hi’,” Holland said. We all walked away from the table in agreement that asking a question or reaching out to someone that is different from yourself can go along in making our community a place everyone feels accepted.